1. JoomlArt: JA Joomla GDPR updated for bug fixes. 2. GavickPro: GK Reservation plugin captcha v2 and bug fixes. 4. 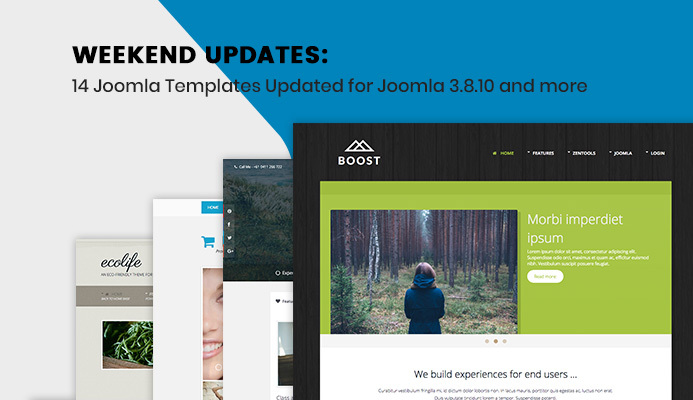 JoomlaBamboo: 14 Joomla templates, zengrid 4 framework updated for Joomla 3.8.10 and bug fixes and 5 templates quickstart exported for Joomla 3.8.10. Update mailer with reply to. CSS error on icon print & email. Can't click to expand on Smart Search. iphone portrait: CSS error on Checkbox of contact form. iPhone portrait: restyle for Hikashop 1 column. Get error on config Article. Get error on icon System of Joomla Article. CSS error on Product page. Hikashop: CSS error on Hikashop Page. iPhone Landscape: CSS error on Label of Register page. Missing content of Dropdown box. iPhone: Restyle for Label in Contact Form. Zentools: Restyle for Page button. Wrong position for label on Remind page.